If you ride in the cold, high humidity, rain or fog, you're very familiar with annoying (and potentially dangerous) faceshield/visor fogging. There are many commercial products and home remedies out there, ranging from a potato rubbed on the visor to fabric breath guards to special anti-fog visors and inserts. The bulk of the anti-fog products on the market are liquids designed to coat the visor's inner surface to prevent fog from adhering to it. I've used a few such anti-fog coatings over the years; some have not worked at all, while others have worked well but only for a very short time. 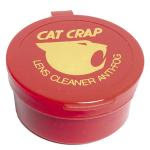 So in my quest to find an effective and long-lasting anti-fog coating, I recently tried Cat Crap Lens Cleaner & Anti-Fog. This product, and others under the Cat Crap moniker, is well-known to skiers and readily available in the USA -- I bought mine from a local ski shop. Following the directions, I cleaned the inner surface of my visor and then smeared on a thin coating of the green, waxy Crap, followed by a thorough buffing with a lint-free cloth. I plopped my Arai Signet on, closed the visor and vents, and exhaled heavily several times: only very slight fogging, and that was around the edges I couldn't coat with Crap with the visor installed -- so very good anti-fog properties. While commuting to work on a dark, clear, cool (about 52F) morning, I discovered that Cat Crap was doing a good job of keeping my visor clear, but was causing a rather large "halo" around all street lights and oncoming headlights, the effect of which grew in proportion to the closing distance to the light source. On a few sharp backroad corners, I was essentially blinded for a second or two when the multi-colored halos from oncoming headlights filled large portions of my field of vision. Thus, while it is relatively easy to apply, inexpensive, fairly effective at keeping fog at bay, and small enough to carry along in a tankbag or jacket pocket (and has a cool name! ), I must deem Cat Crap unacceptable for motorcycle use. I may work fine for skiiers and such, but motorcyclists can't afford any degree of reduced visual acuity, particularly in the dark. I haven't tested it in rainy daylight conditions, and frankly won't. While I expect the loss of vision wouldn't be as bad as in the dark, I'm not willing to take the chance. Bottom line: Don't buy this Crap. Hmmmm, now where's that potato? I perused the MCN review and saw how they liked the stuff whereas you did not. Based on your review I am passing. Thx for visiting! I'm a big fan of MCN and give their reviews a lot of credence, but I don't agree with them in this case. Perhaps they didn't test Cat Crap in the dark. I've tested more anti-fog "solutions" (reviews to follow), and Cat Crap is the worst in terms of visual distortion, which makes sense as it's the thickest consistency. A faceshield won't absorb anything, so whatever we put on it we end up looking thru. "Cat Crap" has been known to me for decades from another world, that of scuba diving. I don't use it for motorcycling either, though, instead I use a tiny dab of shaving foam right out of the aerosol can, then buff it with a clean tissue (no paper towels) or lint-free cloth. Cleaning staffs in hotels use it on bathroom mirrors. Thank for visiting my little website, and for the comment! I'll add shaving foam to my list of stuff to try. I got a problem with fogging when I work. I use a power washer and a stripping bit to remove paint. I need scrips and I need uv protection so I have transition sport glasses, Bifocals to be exact. I'm gonna try the cat crap, but I did try the shave cream and it seems to work so far around the house working in the heat. I'll put it to the real test in the field.